was an aubergine that launched Tripp on his last once-upon-a-time, that made him decide to marry the girl in the third floor apartment—that and the fact she was the third occupant in as many years. Tripp figured all that had to mean something since besides being a vegetarian and fond of eggplant, his life was rich in threes: youngest of three children, all born in March, third in his family to complete college. Recent validations included his meteoric career advancement—three promotions in six years, something of a record for an insurance actuary, he’d been told. Of course, there were less savory factors—the collapse of two relationships in the same period, for example. His latest romantic failure—Alice’s defection—had come weeks short of a third ‘anniversary’. “Even so, I think this time’ll be the charm,” Tripp told his friend Thomas in announcing his amorous pursuit of the third-floor woman. His friend wasn’t persuaded. “A technicality of civil ceremony,” Thomas persisted. “Sounds like you’re wishing on stars, betting everything on crazy odds—and a vegetable! Since when does a woman’s preference for eggplant constitute an omen?” he’d wanted to know. Tripp dismissed his friend’s skepticism. Thomas wasn’t the only one with facts to dispense. Tripp hadn’t mentioned the real reasons for his matrimonial quest. That was because his friend would’ve had a field day with the notion of fateful encounters. No such qualms on Tripp’s part. What else but numeric kismet had him hurrying into the lobby of his apartment building thirty minutes late on that portentous Friday? Wasn’t he famous for his punctuality, the man who arrived at work on the stroke of nine, who took lunch breaks at precisely 12:15 p.m., who left for home at 6:00 on the dot? Weren’t his business meetings assiduously limited to forty-five minutes, and never scheduled on Friday afternoons? Yet somehow, he’d been put off on that fateful day. An unprecedented Friday afternoon meeting (called to accommodate an important client), the number 21 bus breaking down on Broadway, the ensuing difficulty of grabbing a cab on a Friday afternoon—all had played a hand in determining his late arrival. And to think he’d simply been trying to get home in time for the evening news, romance the last thing on his mind! Yet she’d been waiting for him in the lobby—the woman from the third floor—swinging her grocery bags in front of the elevator. Waiting to make his heart stop. Three minutes either way and the tale might never have been written. 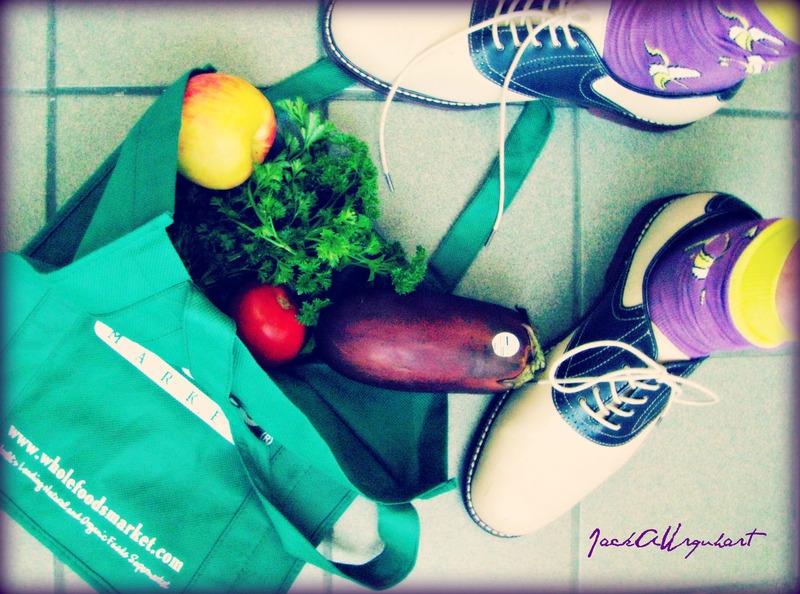 There was no way encountering his future wife had been mere chance—ditto that one of her grocery bags should give way at precisely 6:51 p.m. Tripp felt certain that only a mathematical certainty could’ve accounted for that eggplant rolling to a stop against his saddle shoe. Bending down to the runaway aubergine, he’d noticed the bar coded sticker right off—noticed the first digit of the PLU number was “9,” the square root of which was “3.” Plus “9” signified non-genetically modified, organically grown produce. A slender thing, waifish, she’d been wearing over-sized dark glasses, a leopard print stretch-pleated head-wrap, recalcitrant ginger-colored curls coiling out at her temples. Base fiddle strings, her voice, strummed in a lower register. “One in nine? I should’ve known,” Tripp mumbled. It was the way she kept swinging her grocery bags—like a little girl playing grownup with her mother’s purse—that poked his memory. “That so?” she replied, sliding her dark glasses down for a closer look at him. “I’m a vegetarian too, but I’ll keep that in mind,” she said as the elevator doors closed. Tripp considered gratitude, however oblique, sufficient encouragement. He allowed three days before his next move, enough time for a mail order delivery. “Hi, I noticed you buy organically grown produce,” he’d begun when the woman in the third floor apartment answered her door the following Monday evening, a bath towel wrapped turban-style around her head. “So I thought you could use this,” he said holding out the book. He’d been unable to stop staring into her eyes—eyes that absent sunglasses were the color of ripe avocado. She had a just-washed shine, her face sprinkled with crouton-toasty freckles. “I’m Tripp … from downstairs,” he croaked over the electric bee buzzing of the faulty overhead light fixture in her entryway. He thought it a good sign that she wasn’t put off. Rather, she snatched the book from his hands so decidedly that Tripp wondered if she thought the whole thing a joke. “That light fixture’s a hazard,” she muttered, eyes flicking briefly above his head. “I’m Tress. Plain Tress,” she answered, giving him a blank page look. Tripp felt chilblains along his spine. Surely there was nothing plain about her. “I f-f-found the book online,” he stammered. “The Earthbound Cook,” she sing-songed, voice ascending the treble clef in a single triad. “Thing is, I’m not pursuing earthbound relationships at the moment. No boyfriends. Just rid of one eighteen months ago,” she said, allowing an edgy smile. “Me too,” Tripp countered. And then, realizing his error: “A girlfriend, that is! Fifteen months and counting,” he said conscious of the sweat beading on his brow. Not a bad second encounter, Tripp thought, rocking back on his heels. Not bad at all, he decided, stooping to tie his shoe. At least she hadn’t slammed the door in his face, and that cryptic “Catch’ya later,” implied a future. Best of all, her face looked honest—like she wouldn’t lie about not having a boyfriend. Encouraged, he decided on step three—again, allowing three days. Time enough to send his Nehru shirt to the cleaners, to locate his favorite string tie—the one with the silver and turquoise slide. Time enough to visit the greengrocer. The following Friday, he left work ninety minutes early. At six forty-eight, Tripp stepped out of the elevator on the third floor. Again, she took quickly what he offered, as if he might be an Indian-giver. Surprised, it occurred to Tripp that he hadn’t considered the possibility. For a moment his confidence wavered. Tripp hesitated. “I’ve had … two girlfriends,” he stammered before realizing his mistake—much too late to avoid the niacin flush scorching toward the top of his head. Surely there was smoke. She smiled, the dimple in her right cheek just deepening. Not a red-hot come hither smile. More like comfortable bath water. That electrical buzzing again, the sound amping up just as a scattering of loose screws rat-a-tatted onto the tile floor. Seconds later, a crescendo of sparks, a small thundercloud of ozone-infused smoke as the overhead light fixture gave way from its moorings. One-two-three Tripp counted as the plastic globe swung loose between them on a tangle of wires. Stunned, he watched the mechanism crash to the floor and roll to a stop against his foot, the various wires sprouting like stems and tendrils from the plastic orbicular casing. “Well!” the third-floor woman named Tress exclaimed in the sudden darkness. “Talk about harbingers! I expect you’d better come inside. Besides, if this salad’s half as magical as it looks, I might have to marry you,” she sighed taking his hand to lead him past the wreckage. “You can set up the TV tables. The News Hour’s on in three minutes,” she said freeing Tripp to envision a trove of happily ever afters. This entry was posted in Uncategorized and tagged actuary, coliform bacteria, Eggplant, Jack A. Urquhart, M-F romance, norovirus, odd relationships, oddballs, PLU number, relationships, reusable grocery bags, romance, short fiction, short story, three, triad, vegetarian. Bookmark the permalink. I love multiples of three – speaks to my ocd 😉 this is a lovely little fairytale – with an open ended happily for now I can appreciate! 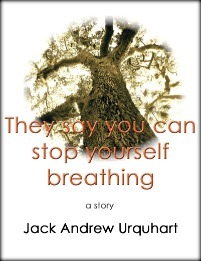 Sessha: I can testify – from first-hand observation – that Jack wrote the book on OCD. Moi! OCD? Surely you jest. There’s not an obsessive bone in my foot, my leg, my arm, my hand. Not in the right ones or the left ones. Not an obsessive thought in my mind either — waking or sleeping. I’m not even sure what you mean by ‘obsessive.’ Do you mean all-consuming, consuming, compulsive, controlling, obsessional, fanatic, fanatical, neurotic, excessive, overkeen, besetting, tormenting, inescapable, pathological? Were you thinking some combination of the possibilities? Sheeze, now I’ll be wondering about that all day! BTW: What’s for dinner tonight? Meat or vegetarian? Do you think my cholesterol is really too high? And about those new shoes — do they make my feet look too big, like pontoons? Just wondering. Hi, Jack! I think this is a great piece! Clever, full of dead-pan humor and funny symbolic imagery, and different from what you usually write! So this is what you’ve been doing with yourself lately! Yes, you’re a fine literary craftsman! I’m more of an inspiration person and less involved with craftsmanship, I fear. With me, if it comes out right, it comes out right (although revision can improve it), but if it comes out dull and flat and wrong, no amount of diddling with it will help! I’d rather be like you, Lorinda. More prolific, not angst-ridden, not prone to bouts of omphaloskepsis. LOL. What a relief that would be. Great story, Jack. Wonderful imagery & nice use of humour. Really enjoyed!